Manu-o-Kū (Gygis alba) is a native Hawaiian seabird found throughout many tropical and subtropical areas in the Pacific, Southern Atlantic and Indian Oceans. You may know them by one of their many common names: White Tern, Fairy Tern, Angel Tern or White Noddy. What makes manu-o-Kū so special to Honolulu? ​Found throughout many tropical and subtropical areas of the world, most of the Hawaiian population of White Terns are located in the Northwestern Hawaiian Islands. The only main Hawaiian island where manu-o-Kū can currently be found is O’ahu, but you can’t see these graceful birds just anywhere on O’ahu. The urban and suburban areas of Honolulu, from Niu Valley to Sand Island, are the only places to find nesting manu-o-Kū. While they may be seen flying overhead in other areas of the island, these seabirds currently only nest in the city. 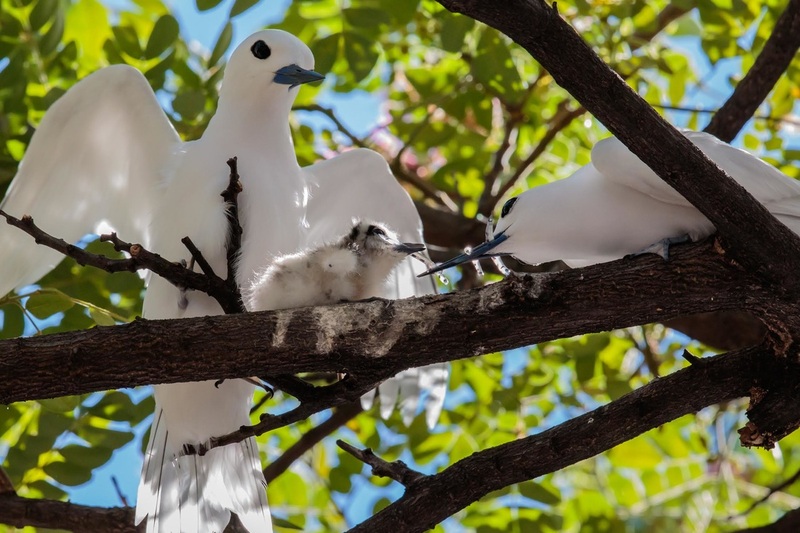 Because Honolulu is the only city in the United States where manu-o-Kū nest and because they are one of the few native Hawaiian birds that can be seen in the city, Mayor Mufi Hanneman designated the manu-o-Kū as the Official Bird of the City and County of Honolulu in 2007. What do manu-o-Kū look and sound like? ​Manu-o-Kū are a medium-sized, completely white tern. The males and females are identical and they have the same plumage regardless of season. Their wings are long and narrow, a common trait of tropical seabirds, allowing them to fly hundreds of miles without using much energy. Their wingspan is approximately 27-34 inches. They have a shallowly forked tail and short, pale blue legs. The adults and immatures look very similar with some minor differences. The adults have a black eye ring, making their eyes appear very big and elongated or oblong. The juveniles may have incomplete eye rings, while younger chicks will not have an eye ring at all making their eyes appear rounder and smaller than those of the adults even though they are not. Adults’ bills are long and sharply pointed. Their bills are almost entirely black except for a blue base. Immature manu-o-Kū have a shorter bill without the blue base. Downy tern chicks usually have more brown, tan or gray coloration. As they get older and their juvenal plumage comes in, they will lose much of that coloration except for some minor brown or tan streaking. By the time they reach breeding age, they are completely white. For more information differentiating between ages, please see our Volunteer Training Packet on the Citizen Science page. Adult manu-o-Kū make a raspy call sounding like grrich-grrich-grrich or eenk-eenk-eenk. They usually make this call when other terns are nearby. The chicks will make soft hisses or chirps which is a begging call for food. It is common to hear this when an adult returns to the chick at the nesting site, especially if the adult has fish. When do manu-o-Kū breed and how long do chicks stay at the nest? Manu-o-Kū breed during all months of the year, but the busiest breeding season is January through June, with a major peak in March. They start breeding at 5 years old. An adult will lay a single egg directly onto a tree branch. The egg will hatch after about 35 days. The chick stays very close to the site it hatched when it is small. Both adults will bring fish to the chick multiple times per day. After about another 45 days, the chick will be big enough to start to fly. 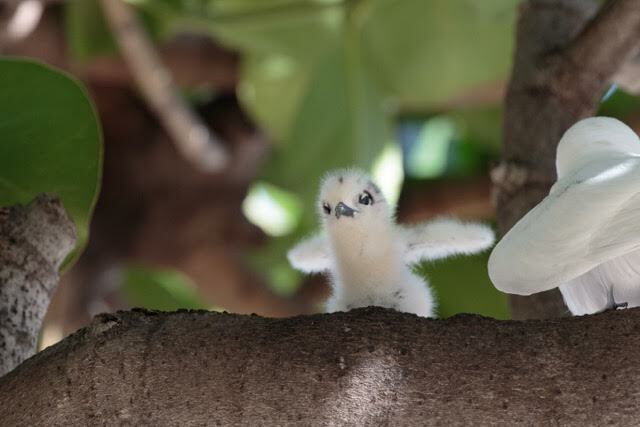 At first, the chick will fly around its home tree, then start expanding its range to neighboring trees and the surrounding neighborhood and eventually around the island and out to sea. It will continue to return to the nesting site daily to be fed by the adults. While it is unknown how long it will continue to do this, it is believed that the juvenile will return to the nesting site for a few months until it finally leaves the nest for good. If an egg or chick doesn’t survive, a breeding pair of adults may renest at the same exact nesting site. It is not uncommon to see a pair raising a chick and have an egg at the same time. Manu-o-Kū may have up to three offspring during one year. The adults will likely return to the same tree year after year to raise their young. What's on the menu for manu-o-Kū? ​Manu-o-Kū are eat small fish and squid. They forage in inshore and offshore waters. They feed at the ocean surface in association with other seabirds and predatory fish that drive prey to the surface. They catch prey from the water surface or in midair as fish jump to escape predatory fish, a behavior called air-dipping. They usually fly out to sea to forage during the early morning or late evening. Their feathers are nearly translucent from below when there is low light, helping to conceal them from their prey below. Manu-o-Kū are opportunistic eaters, they will catch any fish or squid of the appropriate size. The main prey that they catch include goatfishes (Mullidae), flying fishes (Exocoetidae), needlefishes (Belonidae), halfbeaks (Hemiramphidae), dolphinfishes (Coryphaenidae), silversides (Atherinidae), comb-toothed blennies (Blenniidae), purpleback flying squid and glassy flying squid (both in Ommastrephidae) but as opportunistic feeders, they will feed on a wide variety of prey. If you look closely at flying terns, you may be able to see fish being carried in their bill. Adults will catch multiple fish or squid and bring them back to the chick at the nest site. How many manu-o-Kū are there in Honolulu? ​Today, manu-o-Kū are a common sight throughout the city, but it hasn’t always been that way. Prior to the 1960s, only visiting manu-o-Kū were seen passing through O’ahu. In 1961, a single pair of adult terns with an egg was discovered on Koko Head. From that single pair in 1961, the population grew to about 700 adults in 2003. The population has continued to thrive in this urban landscape, reaching about 2,000 birds today. They can easily be seen flying overhead or roosting in large trees in parks and along the street. What is a seabird like manu-o-Kū doing in such a busy city? The hustling, bustling city of Honolulu would seem like a difficult and unlikely place for a seabird to live. Living in a city leads to many threats for a seabird such as introduced predators and tree trimming. One hypothesis why manu-o-Kū are able to thrive in Honolulu is that heavy pedestrian and vehicular traffic actually protects the eggs and chicks from introduced predators such as rats (Rattus sp.) and feral cats (Felis catus). Rats can climb trees and kill eggs or chicks and cats may kill a chick that has fallen from its nest. Tree trimming can be harmful to the population if an active nest site is cut, but it can be helpful too. If trimming is done with care at the right time of year when there is no active nest in the tree, it can lead to improved nesting sites on the branch. 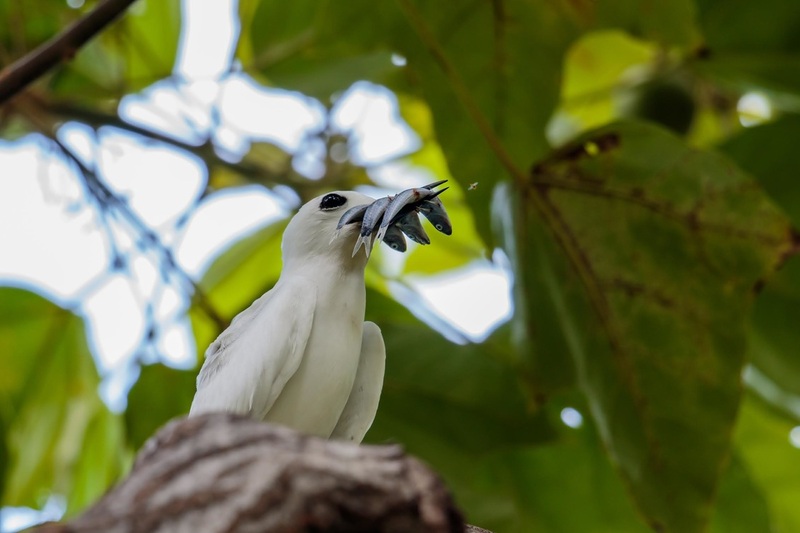 When a branch is cut, the tree is likely to form a “cup” in the branch which is the best place to lay an egg and raise a White Tern chick. This “cup” is more secure than a straight branch and tends to lead to greater nest success. Urban Honolulu has a large number of mature open growth trees surrounded by low or no vegetation like lawns or pavement. Such trees provide large horizontal limbs for good egg-laying and are easy to fly to and from. Where do manu-o-Kū build their nests? ​One of the most unique things about manu-o-Kū is that they don’t actually build a nest. Instead, they lay their egg directly onto a surface. On other islands, manu-o-Kū are known to nest in trees, shrubs, on cliff ledges, directly on flat ground, on manmade structures such as window sills and air conditioners or on any other suitable location. However, Honolulu’s manu-o-Kū seem to always nest in trees, laying their egg directly onto a branch. An adult will search for an ideal nesting site, usually in a fork, slight depression or cup in the branch or a rough spot in the bark of a branch. When the chick hatches, it will stay on the branch at or near where the egg was laid until it can fly. While they are at risk of falling due to high winds, they have strong claws that allow them to grip onto the branch. Even days-old chicks are able to hold on through a strong storm! Their favorite tree species in Honolulu include Kukui (Aleurites moluccanus), Monkeypod (Samanea saman), Shower Tree (Cassia sp. ), Mahogany (Swietenia sp. ), Banyans (Ficus sp.) and others. ​Manu-o-Kū are federally protected under the Migratory Bird Treaty Act. This law makes it illegal to hunt, take, capture, kill, etc. the birds or their eggs. Even attempting one of those actions breaks the law. Violations of the Migratory Bird Treaty Act can result in a fine of up to $15,000. Due to their small population and limited range within the main Hawaiian Islands, manu-o-Kū are listed as Threatened by the State of Hawai’i, which furthers their protections. This status protects them from all of the aforementioned actions in addition to simply disturbing or harassing any nesting birds. Violating one of these actions can result in a fine of no less than $250 and/or imprisonment of up to one year. If you observe someone disturbing or harassing a manu-o-Kū please call Hawai’i Department of Land and Natural Resource Enforcement hotline at (808) 643-DLNR (3567). What does manu-o-Kū mean? Are they culturally significant to native Hawaiians? Manu-o-Kū means “Bird of Kū” in Hawaiian. Kū is the god of war in Hawaiian mythology and is represented by images of a feathered god. Some linguists believe the manu-o-Kū name was derived from “ohu”, the Hawaiian word for fog, mist or cloud. Manu-o-Kū are known by traditional Hawaiian navigators as one of the best indicators of land. Seafarers use manu-o-Kū to aid in navigation because they generally will fly out to sea in the morning to feed and then return to land at night. By going the direction the birds are coming from in the morning and following them at night, navigators will likely reach land. Even though terns may travel hundreds of miles, the presence of these birds in the vast Pacific Ocean can assure wayfinders that they are near land. How can public citizens help conserve manu-o-Kū? Do you feel a special connection with manu-o-Kū? Have you ever wanted to be a scientist or assist in a scientific project? Do you want to help keep track of manu-o-Kū so we can have a better understanding of the population and improve the long-term survival of the O’ahu population? Anyone can be a citizen scientist and help us keep track of manu-o-Kū and their nesting activities throughout Honolulu! Volunteers of all ages and abilities can help collect data on nests, track the progress from egg to adult, and help us map every nest in the city. Please visit our Citizen Science page to learn more! Morgan, L. May 2007. Manu-o-Ku Named the Official Bird of Honolulu. 'Elepaio, 67(4), 25-27. Mitchell, C, C Ogura, DW Meadows, A Kane, L Strommer, S Fretz, D Leonard, and A McClung. October 2005. Hawaii’s Comprehensive Wildlife Conservation Strategy. Department of Land and Natural Resources. Honolulu, Hawai‘i. 722 pp. Miles, Dorothy H. October 1986. White Terns Breeding on Oahu, Hawaii. ‘Elepaio, 46(16), 171-175. Pratt, H. D., Bruner, P. L., & Berrett, D. G. 1987. A Field Guide to the Birds of Hawaii and the Tropical Pacific. Princeton, NJ: Princeton University Press. VanderWerf, Eric A. September 2003. 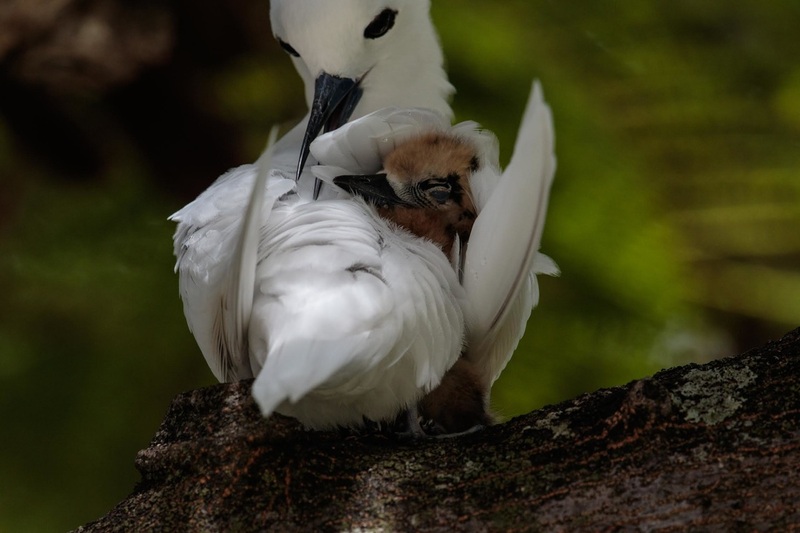 Distribution, Abundance, and Breeding Biology of White Terns on Oahu, Hawaii. The Wilson Bulletin, 115(3), 258-262. VanderWerf, Eric. February 2016. White Tern Information Sheet. Pacific Rim Conservation.